The present St James Church building is the fourth Hutt Valley church to hold that name. It was constructed in 1953, to replace the previous wooden building destroyed by fire in 1946. The design of the building by Ron Muston of the Structon Group was awarded a New Zealand Institute of Architects Gold Medal in 1954. It has recently been listed as a heritage building. At the time of the mid-twentieth century Modern Movement, the Gothic style still held sway in New Zealand for church design, as with the remainder of the Western world. The design of this modern church is a break with the traditional forms, yet it retains a spiritual quality that is both inspirational and stimulating. 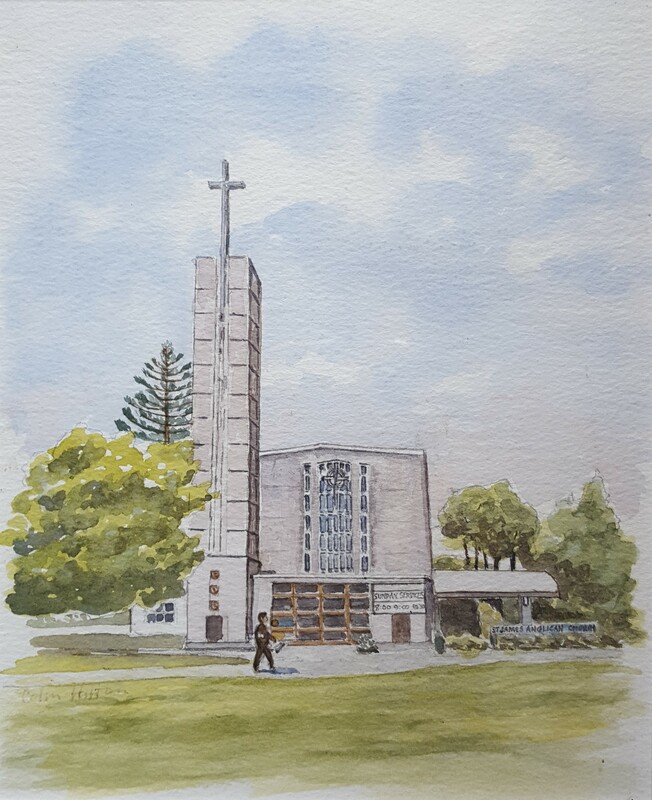 Since its construction the church has been recognised as a distinctive and important example of modern New Zealand church architecture. The building is dominated by the tower standing out “stark and uncompromisingly”. Surmounting the tower is a Cross. The Vicar at the time, Canon Bretton, stated that the bell tower is there to remind us, even to startle us into a realisation of what the Christian faith is. We are not dealing with any soft religion… Christ stands amidst a work-a-day world, in work-a-day clothes, to challenge it in every part to take His Way”. Some changes have been made to the building since 1953, including the raising of the choir stalls area, the removal of much of the original Formica and the construction of the David Wylie foyer in the entrance area to provide a more welcoming and functional approach to the Church. This panel was designed as a tribute to the spirit and actions David Michael Wylie showed in his work through the Anglican Church during his lifetime. Tukutuku panels line the walls of our whare. They are the story of our people, the stories of our history; they teach us as we grow. They are a taonga that we have created with our aroha. In the making of such a taonga there is sharing and trust. The wood is Rimu, the bindings are leather. The children prepared the wood with oil. The tukutuku panel was placed on its work frame. The making of the panel was then blessed with Karakia by The Reverend George Common of the Maori Pastorate. Then waving of the panel began. There are four traditional patterns and a very easy to define Rīpeka (Cross). We will start from the base of the Tukutuku panel. At the base is Kaokao. This is a design of strength and the strength is the people. Nestled within the Kaokao is the Rīpeka (Cross), or Church, as a part of the people. Then you have the Poutama (Staircase to Heaven) leaving from the shoulder of the Cross. From the Poutama there are Toimata (Tears) falling through the Cross and to the people, representing the work of David Wylie in and out of the Church and his spirit which touched all people from white through to black. The final design at the top is Purapurawhetu (Stars/Saints of the Night Sky). The Tukutuku panel is also a tribute to the people who worked and wove it to its completion. The girls and women especially were open enough to learn the Mauri and Wairua of such a gift. In learning the being open they have ensured that the panel will always be part of themselves and the Church.The Tukutuku panel was blessed throughout the time of its making by Te Wairua and would not have been finished without it. Bishop Hapai Winiata blessed the panel at the opening of the foyer. It is a Māori taonga and a bi-cultural statement.